Anyone know where are the fireworks being launched from this year? I thought it was from behind the Middle School? Wait a second. Didn’t this used to be the Fourth of July post? for flea markets, live music and firework displays. Ross, I think Sean’s right. You wiped out your 4th of July post. Sean and Griff, I goofed. The 4th of July was intended for http://www.nddc.org. Want to talk fireworks, go there. Community Building reading list was supposed to be on Locally Grown. Want to talk books, stay here. Here’s a bunch more: “THE EXPERIENCE OF PLACE’, TONY HISS, a new way of looking at and dealing withour radically changing cities and countryside. ‘TOWARD THE LIVABLE CITY’, EMILY BUCHWALD, smart growth, pedestrian rights,regional planning, riverfront development, more. “SUBURBAN NATION”, DUANY, PLATER-ZYRBEK, SPECK, the rise of sprawl and the decline of the American dream. “CONSERVING WOODED AREAS IN DEVELOPING COMMUNITIES” , MN DNR, best management practices. “HOME TOWN ADVANTAGE”, STACY MITCHELL, preserving locally owned small businesses. “THE NEXT AMERICAN METROPLIS”, PETER CALTHORPE, ecology, community , and the American Dream. “LAST HARVEST”, WITOLD RYBCZYNSKI, How a cornfield became New Daleville; land use regulations and ordinances. There are a few more that I’ll get later.they’re in a different bookcase. Thank you for the topic kickoff and the suggestions, Ross. I’m also a fan of Moe & Wilkie’s book – the issues are still timely after 10 years, which tells me they’re on to something. and of course Jane Jacobs’ classic, also mentioned before. These aren’t all directly about building a better community, but they’re strongly relevant to the topic. Thanks to Ross, Kiffi et al for the other recommendations. thanks for reminding me about Oldenburg’s “The Great Good Places”, it moves the discussion from physical design to building community. For those of you that finished reading all the planning theory and enjoy the enginering design aspects of making projects and developments context sensitve, I recommend that you read “Context Sensitive Solutions in Designing Major Urban Thoroughfares for Walkable Communities. The Institute of Transportation Engineers (ITE) advances context sensitive solutions (CSS) in this document for the planning and design of major urban thoroughfares (local streets, roadways and highways) for walkable communities. People like Peter Calthorpe and Andres Duany were on the policy committee that assisted in crafting the document. Excellent bed time reading! By the way it’s free on the website. Thanks a lot for stopping by the store, Ross, and for the free pub. I’m sure the Ape-In-Charge of Monkey See, Monkey Read appreciates it as well. Unfortunately — though he wouldn’t think so — Jerry is temporarily unavailable. Pinch-hitting, I’d say this is already an impressive list. Another I’d throw onto the pile is one I read recently, “Deep Economy: The Wealth of Communities and the Durable Future” by Bill McKibben. Though perhaps that title has been discussed previously on this site. I’m sure when Jerry rejoins the online world he will have more enlightening wisdom to share. Thanks for the link. Perhaps you might summarize the 221 pages and tell me what it says about making pedestrian crossing at 3rd Street and Highway 3 a safer experience. Does the Associate Primate try harder? Shuman mentions McKibben when he talks about redirecting your local economic development efforts away from trying to lure the next Saturn plant to town and instead focusing your energies on what we used to call “Import Substitution” back in my undergrad days (…oh my goodness, we’re back with Adam Smith once again) where you encourage existing or start-up businesses to produce products that you’re “importing” from outside your economy. Sounds like Asset Based Community Development to me. Perhaps Council Member Scott Davis will weigh in on the topic. Perhaps if you read it yourself you might come up with your own answer. Anyways, I don’t want to spoil the ending for you. thanks for calling me out and sorry for the delay in posting. I spent the 4th of July in the UK. Apparently, they don’t celebrate it like we do. Go figure? There’s not much I can add to the list that has not been mentioned. Rybczynski is one I recommend and definitely Suburban Nation. I read McKibben’s Deep Economy recently and it is excellent, not too much urban planning, more local economy. Smallmart and Stacy Mtchell are both good. I am a strong believer in public space. I think the Cannon river is an untapped resource for Northfield. Look at what waterfront redevelopment has done for Baltimore or London. London’s south bank was the seedy underbelly, now it is beautiful. street performers, skate park, museums, restaurants, cafes etc. Port Townsend Wa is a good example of what can be done on a small scale, I believe the population is similar to Northfield. 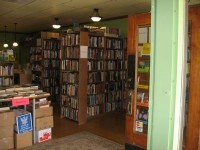 Port Townsend is an art town, lots of local artists, music festivals historic downtown, etc. Imagine if Bridge Square were expanded. close off water street from the parking lot to 4th, 1/2 a block. add a foot bridge to ames park. put something on ames park, anything. a bandshell, public art, a public garden. Yes, it floods, so a building is out of the question, something other than a place for geese and a carnival that lasts 4 days. check it out, a few years ago, this was pit, dumping ground for garbage. Jerry, or In-Charge Ape, thanks for rejoining us. You and I sure love books but the three-dimensional examples are always a treat. Perhaps we can get Rick Estenson and the Rotary Club to build Mary Rossing’s Bandshell in Ames Park as a contribution to community and economic development. Ross: How could you not mention “Death and Life of Great American Cities” by Jane Jacobs? I read it first in college during the sixties, and it made a lasting impression. I’ve read it a time or two since. Her understanding of what makes urban places vibrant and human are unmatched in anything else I’ve read about building community. Having just moved from Lakeville to Northfield, I see the mix of uses in downtown Northfield — work, play, live — that Jacobs talks about. 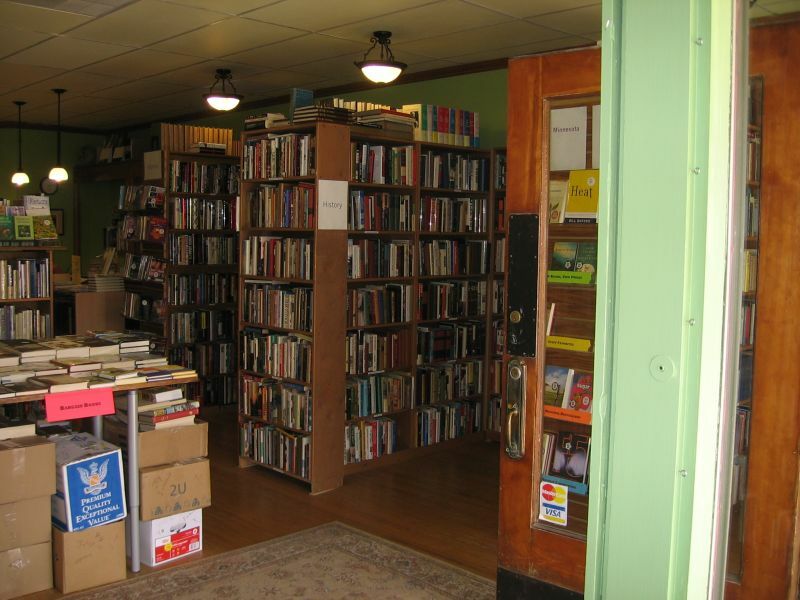 Jerry Bilek’s bookstore is an example of a place that keeps a downtown alive. It’s also a place that forces Type-As to slow down with a good book. I found a novel there that has nothing to do with community building or planning, but it’s a marvelous story about friendship and family. It’s Summer Crossing by Steve Tesich, author of the biking flick, Breaking Away.